A SELF-PROCLAIMED COLLEGE BAND reformed to a heyday later in life that far exceeds their 90s peak, King Kong Company are fast becoming Ireland’s go-to festival act, and with good reason. The Waterford based act are a high energy, upbeat dance six-piece with plenty of stage moves. 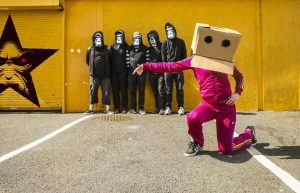 One member performs in a cardboard box with crudely cut eye holes, while recent outings include a trip to iconic UK festival Glastonbury, a tea party at Michael D Higgins house, and even the launch of their own unlikely beer infused with Buckfast, with King Kong Company plastered across the front. Colin Hoye, the group’s trumpeter, is the one member currently based in Dublin, and met the Gazette to describe what’s been a strange journey and a wildly busy summer to date. Amazingly, their self-titled debut of 2016 is the band’s only formal release to date, despite performing together from 1996 to 2000, and then from 2011 to today. Whether the album or an incredibly notorious live show are the defining factor, there’s little doubt that King Kong Company are on an all time high this year. 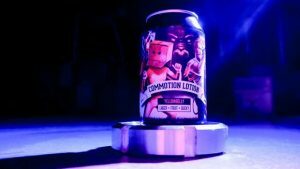 Last month, their striking imagery appeared on the front of a new brand of beer from Wexford craft beer company Yellowbelly, entitled ‘Commotion Lotion’, and infused with Buckfast. The launch came within days of their Glastonbury appearance, a lively slot at Body and Soul and a toned-down show at Aras An Uachtarain. Few bands ‘test’ with quite such a sense of fun.